I think Baird and Beirne are good comps, excellent athletes in the row. What you think? Baird is similar to Beirne at maul time (both are a huge pain in the arse there). Baird is faster while Beirne is much more of a specialist on the deck. Don't know about Leinster but have heard that Munster and Connacht have been sniffing around Ulster academy or soon to be academy players but again I hear a lot of crap. Of the three people I personally know who have gone through the Leinster academy, two of them had offers from Munster and one from Connacht. Not that there's anything wrong with that imo. To be honest if I was a young Ulster forward I'd be looking Leinster to offer me a deal. How tall is Baird? Does he have the size to bulk up? One year deal for Botha to act as the experienced head to bring on the youngsters who'll be needed during the RWC. Smart signing. He'll fit into the squad as a much better version of Copeland. Maybe there could be a set up where schools players could be picked up by any of the provinces (a possible draft-style system) but club players have to be developed by their own branch. That would have the twin benefits of spreading the talent around and forcing the provinces to look after the club game and develop "non-traditional" areas. Do Leinster ever try to sign players from other provinces to their academy? As in, players born, bred and schooled in another province who would be seen as top prospects. Similar to what Munster tried with Porter last year. Asking out of interest, not trolling. can't think of anyone off the top of my head, last person not from leinster I heard they approached was Kieran Treadwell. there was a welsh underage 7 they approached too, years and years ago - something Thomas. Last edited by irishrugbyua on Thu May 17, 2018 2:50 pm, edited 1 time in total. I dunno if Baird is faster than Beirne, Beirne played 7's and is very fast. Think there is a good comparison there between the two as athletes. Last edited by irishrugbyua on Thu May 17, 2018 2:52 pm, edited 1 time in total. fudge that, if a player wants to play for his home province he should be forced to play for another one because he was drafted by them. I don't think most players would give a shite who they're picked up by, as long as it's not the Cleveland Ulsters. Loyalty and pride in the shirt is fostered once you're in the environment. It's the same in every sport. Ah I don't agree, if bypassed by home province they will look elsewhere, but many dream of playing for home province when growing up and have fierce loyalty to that province. It would be short-sighted to put all out post-Best eggs in the Cronin basket, though, considering his age. He may well go on for a good few years at a high level, but the succession planning needs to have the next couple of guys on their way through the pipeline by the time Cronin takes over as #1, should that happen. I don't see why they can't do both (short term saffers, invest in the right academy structure) - in fact, I'd say that's the best route. Of course the saffas are a short term fix, but if it keeps the team competitive and means younger players are introduced to a stronger side, it's beneficial. The latest signing is a 1 year deal, shows it is only temporary rather than a long term solution. Rob Lyttle's just had surgery according to Ulster. I am sure most of them care about having a personal life and family though. Its not easy just packing your bags and going off to Belfast or Galway on a couple of hundred euros a week, think its as low as 5 or 6k total? I actually didn't think anyone was seriously arguing for megabucks on Academies at the expense of a competitive wage budget for the professional squad. If anything the Six Nations showed that Ireland are turning out players who are better-prepared at a younger age than any of the other teams in the tournament. It used to blow people's mind when they went to watch their mates play 20s against guys who had "already played Super Rugby". 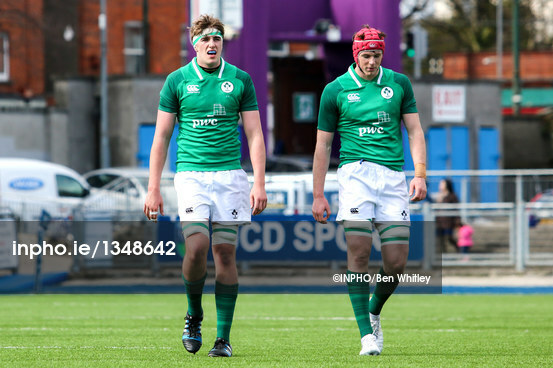 We are getting to the point where the really talented kids have already made Pro debuts at the JWC or are even being pulled from the underage structure to prioritise a full professional pre-season. Who the deuce is Arno Botha? They do indeed, though I think any loyalty gained through actually living in and working with a province is far stronger than any gained watching them on telly. Anyway, I'm just brainstorming. I know it's probably a non-runner, and maybe not even necessary. Club generally covers accommodation, insurance etc. Sheesh! I’m new here. Should we be flattered or offended by the obsession? I heard Leo talking about how when Toulouse won their fourth in 2010, they were miles ahead of everyone else but didn't make the necessary changes to keep that gap. It happens, organisations get lazy and decline. We need to be constantly evolving to ensure that we get the best out of our available resources in terms of players and money. To that end I'd advocate that we over invest in the academy system and beyond. Go down into the schools/clubs with resources and ensure that they are doing the best that they can. Toner, who along with Cian Healy, Isa Nacewa and Johnny Sexton equalled the record of four European Cup wins previously jointly held by former France internationals Cédric Heymans and Fréderic Michalak, played more minutes (673) than any other Leinster player in this season’s tournament and was only one of two players – tighthead prop Tadhg Furlong was the other – who started in all nine matches. Special mention must be given to Healy, Sexton and Nacewa who - if I'm not mistaken - started all four matches unlike the others. Oh I definitely agree but I want to see competition amongst local lads why would anyone choose to take the much harder path via the Leinster academy which seems to be overflowing with forwards? You would need to be tremendously assured of how good you are. Given the fact that Henderson and Ryan are so good, with Toner as back up... Will Joe look at Beirne as a six? But you have Ruddock, POM and Jordi at 6 too! He has to be pencilled in as a lock? Arent we good! You could argue that his form for the Scarlets would have him ahead of those three at 6. He'll push Ryan and Henderson as well. Nice selection headache to have. POM has been poor recently, but has massive credit in the bank. Ruddock has performed well in the past and was in unreal form earlier this season. Beirne will have his work cut out to shift them. He'll be hard-pressed to oust the locks, too. Tadhg Beirne really doesn't seem to want to leave the Scarlets. yeah his quotes today make that pretty clear. Tomane to Leinster story seems to have some legs. On his future beyond the 2018/19 season, Fardy added: “We will see what happens with that. There are a lot of things that have to happen with it being a centralised contract system. It's the least they can do with several of our locks at other provinces! count at the moment is two at connacht, two at ulster, 1 at munster. We gave you Ian Nagle so it evens out.